Gyula Kosice was born in an Hungarian family, in the city of Kosice, 1924. At age of four he came to Argentina, where he took the nationality. Writer, plastic, theoretician and poet, he is one of the precursors of art of the kinetic and luminance vanguard. He studied drawing and modeling at free academies. Co-founder of the "Arturo" magazine, in 1944. Röyi, his first articulated and movable sculpture in 1944. Co-founder of "Arte Concreto Invención" (Concrete Art Invention), 1945. Founder of the Movement of Madí Art, 1946. Author of the Madí Manifest, 1946. Edition of eight numbers of the magazine "Arte Madí Universal" (Universal Madí Art). Creation of luminance structures, 1946, with neon gas used for the first time in the world-wide plane. Exhibition of Madí Art, representing Argentina in Salón des Réalités Nouvelles, Paris, 1948. Creator of the hydraulic sculpture, he uses the water like essential element of his works, 1949. For the first time, use of the water, in the international plane. Father of the Hidrospatial City already announced in the "Arturo" magazine ("Man is not to end his days on Earth"). He has made monumental sculptures, hidrospatial routes, hydromurals. etc. 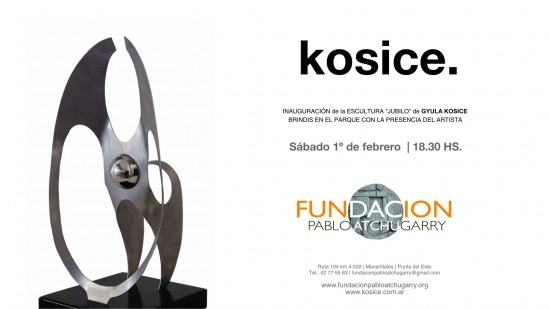 He held the Retrospective Exhibition "A Hundred Works of Kosice, a Forerunner" at the Di Tella Institute (1968) and the Retrospective Exhibition in the National Museum of Fine Arts (1991) in Buenos Aires. He has published 15 books on essays and poetry. He made more than 50 personal exhibitions and more than 500 group exhibitions. He was distinguished Lord of the Arts and Literature by the government of France, and named Honorary Citizen of the City of Buenos Aires. His works appear in Museums and private collections of Argentina, Latin America, the United States, Europe and Asia.